You know I love my knives. 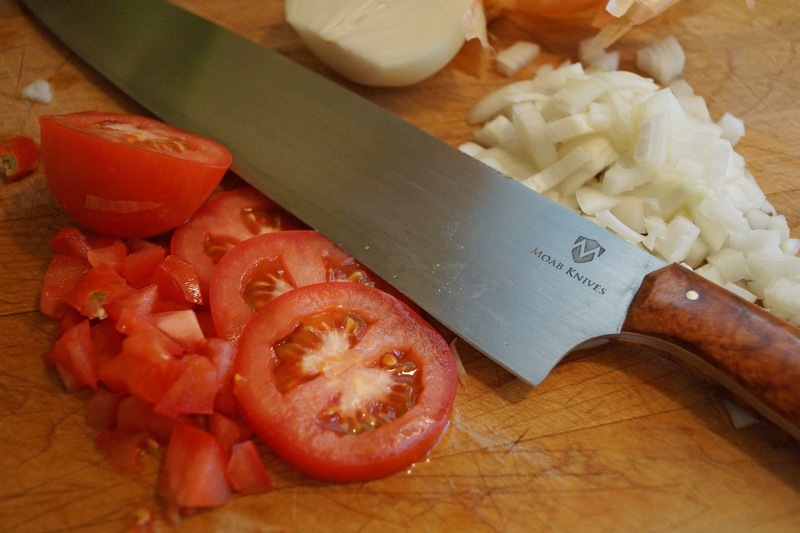 A good sharp knife is essential for all preparation duties in the kitchen. As some of you know I have an extensive collection of custom and high quality knifes at my disposal. When you collect, one can never have enough of a good thing. (Despite Ms. Goofy’s objections) Today I would like to share my latest acquisition of a twelve inch Chef’s knife made by Moab Knives. Moab Knives is a one person operation created and run by David Collett. David Collet is an ironworker by day and Bladesmith by night. 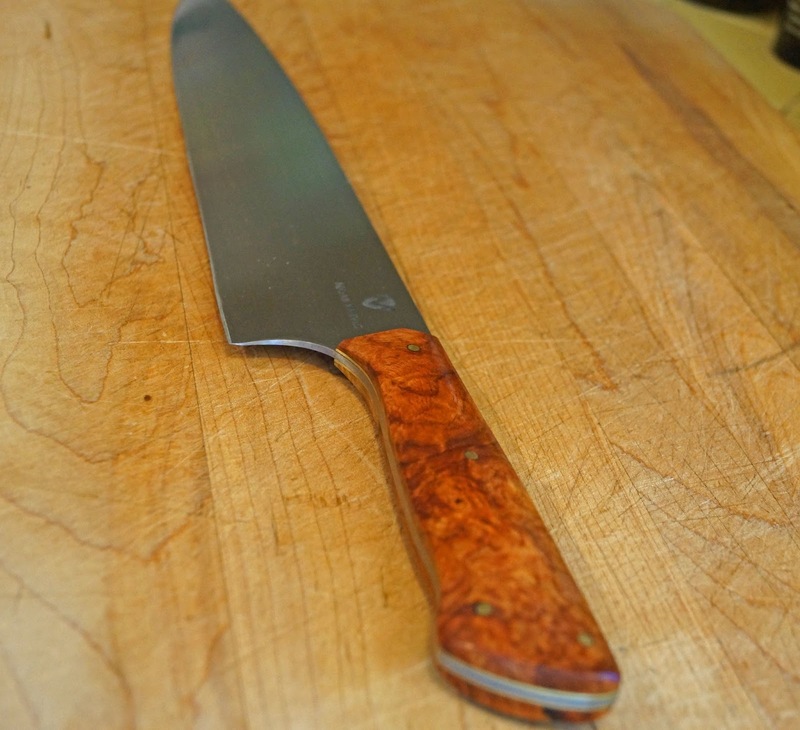 David hand drew the knife design, cuts, grinds heat treats, and hand finishes every blade. I asked him to create a 12 inch blade designed in a traditional Western Chef’s knife style. I also picked my handle material. Three months later, here is the finished product. The blade is made of 1095 high carbon steel known for its edge retention and sharpenabliiy. The handles are made of Amboyna Burl wood. I asked David to make the handle on the large side to fit my hand. The blade is 12 inches long and is sharpened to a convex edge to 20 degrees. Did I mention it is beautiful? Let’s go to the kitchen and cut up a couple of things. My first impression is; WOW!!!!! This knife is sharp. An onion was no match for this power house of a tool. The weight and heft really makes a difference. The handle is large and fits my hand perfectly. What I noticed was how smoothly this tool cuts and glides through its desired object. What I really enjoyed is how balanced this large knife is. I tried my hand cutting a tomato and with surgical precision it was dispatched. I want to go around cutting up things but need to do some shopping. I just wanted to share my beautiful new knife. This will get plenty of use. It is not only functional but beautiful to look at. The size, weight and balance are perfect for this Mad Meat Genius. That is a fine looking knife. How do you keep yours sharp? Big Dude, I have numerous sharpening systems. I have the Work sharp Ken Onion Sharpener, Edge Pro, multiple stones, leather strops and hones. The Ken Onion is the easiest to use. There are times I have brought knifes to a professional. I do use a steel all the time. My dad used to to use the sharpener that was on the back of the electric can opener. Greg, It is performance art sort off. It is a beauty.. Very nice. The full tang design is key. I may have to look up David for a handmade brisket trimming knife. Absolutely a beautiful tool, great craftsmanship.